Visit the Traffic Center Hessen (VZH) in Frankfurt and experience recent developments in vehicle-to-infrastructure communication in Germany! As part of Hessen Mobil – Road and Traffic Management, the road authority of the German Federal State of Hessen, the VZH is a leading institution in freeway traffic management and ITS deployment in Germany. Besides the implementation and operation of state-of-the-art intelligent traffic systems in the Hessian Autobahn network, current activities focus on the development and field implementation of vehicle-to-vehicle and vehicle-to-infrastructure (V2X-) communication systems. Hessen was test field within the field operational test simTD and is currently the leading German participant in the pan-European implementation of the Cooperative ITS Corridor, the first implementation of vehicle-to-infrastructure communication in Europe. You will get into touch with the Berlin highway traffic management and visit the Traffic Control Centre. It monitors and manually activates the traffic lights in Berlin at about 2.000 intersections, as well as nine Variable Message Sign Systems (VMS) mainly on the Berlin motorways. It monitors the traffic situation on more than 1.500 km of roads, and it transmits traffic information of the regional reporting office (TMC procedure). The Berlin centre is one of the biggest state-of-the-art traffic control centres in Europe. The Traffic Control Centre is of particular importance for the work of the Berlin Traffic Control. By collecting all traffic information in one place, the Berlin Traffic Control is able to directly influence the traffic situation in and around Berlin and to minimise or even completely avoid disturbances. Also get to know Berlin's role as a rail capital and learn about Berlin airports and water ways. There is no better way to explore a city than by bike. You are guided through Germany’s capital and learn about the city’s vast history and mysteries. 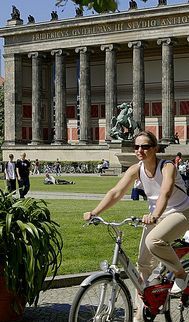 This tour is the perfect mixture of the classic sights and insider tips, suitable for Berlin experts as well as for “beginners”. To all the Must-haves there are insights into nowadays life in Berlin, travelling through the districts of Mitte, Tiergarten and Prenzlauer Berg. Berlin is indeed a bike-friendly city with lots of bike lanes. A lot has changed during the last years, and you will see the bike infrastructure, that will make biking safer and will help to increase the share of people using the bike on trips for all purposes.